Record numbers of children in Scotland are scooting or skating to school, the latest annual survey by cycling group Sustrans showed today. A total of 2.9 per cent of pupils chose the mini-wheels transport last year - more than three times the 0.7 per cent rate in 2010. That represents some 14,500 youngsters, with the rate in some areas such as Midlothian as high as 7 per cent. Cycling returned to its highest level - 3.5 per cent - since the poll started in 2008. 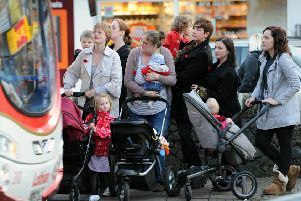 However, there was a 1 per cent fall in walking to 43 per cent and a 0.5 per cent increase in car travel to 22 per cent. The Hands Up Scotland survey covered four in five Scottish schools and nearly 70 per cent of pupils. Sustrans Scotland national director John Lauder said: “With improvements in scooters and other equipment, scooting and skating is a way that many children choose to travel to school – not only improving health and well-being, but having fun too. “Encouraging active travel from a young age means Scotland’s children are more likely to develop good habits that will be continued later in life. Colin Howden, director of sustainable transport campaigners Transform Scotland, said: “Scotland is doing significantly better than England in getting kids to school by sustainable modes of transport.